Schrade Viper OTF Assisted Opening Pocket Knife Black Dagger Point Serrated | BUDK.com - Knives & Swords At The Lowest Prices! 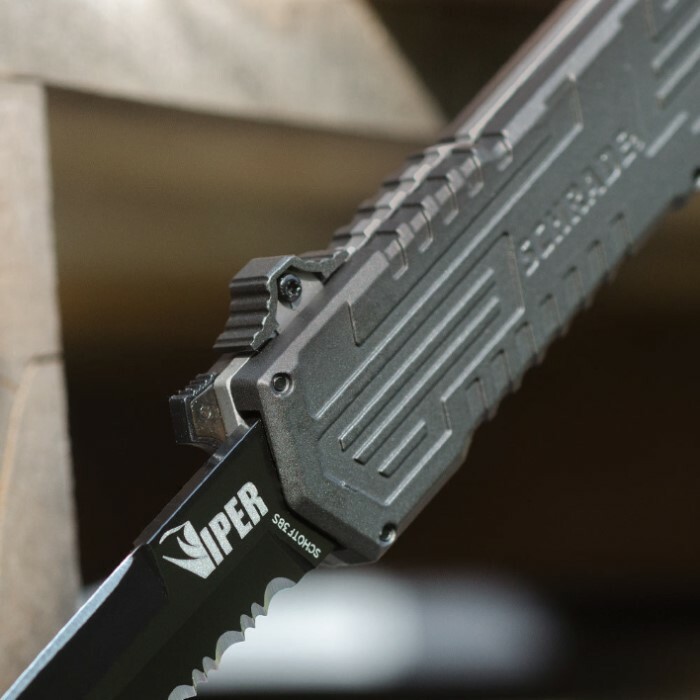 The Schrade Out the Front Viper Assisted Open Knife is the third generation of OTF knives from Schrade. This model features a bead blast finished bayonet style blade that is sharp on both edges. This fast opening assisted knife slides open when you begin the process by pressing the slide trigger on the side. The blade locks up incredibly tight when open. On the front of the extremely comfortable, thin handle, there is a toggle safety that shows a red dot when it is ”live” and ready to fire. To close the blade, you slide the blade lock which releases the blade--which you then slide down and reset using the slide trigger. This is one of our favorite spring assisted out the front knives. It comes with a deep pocket clip and a glass breaker is built into the base of the handle. Get fast--get the Viper! great knife! if you want an otf knife, this is the one. the one thing im concerned about it that the safty might get loose over time but other that that this knife looks and feels awesome! Knife is well made,but when you get it out of pocket,you need 2 hands to open safety and then push blade release. Release needs to be at front of knife some way so it can be opened while having a firm grip on knife. i was completely disappointed the second i took this out of the box. looks and feels like a kiddie toy. it works ok but not what i was hoping for. This is overall a pretty good OTF knife. Lightning fast opening and a pretty reliable safety and a decent price. feels good in your hand. the over all weight is pretty good. its hefty so good build quality. but not to hefty to were is a pain to carry. This is one of the most poorly conceived knives i have ever seen. It is very awkward to open with one hand. you cant pull it from your pocket and open it without looking at it. I would rather carry a brick! If you have one of these and you are attacked simply hand it to the assailant and while he struggles to open it, you can escape. my "lightning OTF" is 10 times the knife for less!!!!! I love this knife as it lives up to the quality of "Schrade" name, BUT,it has one flaw. The "switch" tha opens the blade is attached to the blade itself making it impossible to open with one hand unless you are holding it in your fist upside down with the opening facing down. Then you can open it with your thumb of the same hand but I tried holding it all sorts of ways and can't open it unless I use both hands as the switch slides with the blade. I love it because it is razor sharp on both edges. This a very nice, well built, and easy to operate otf knife. It has a sturdy and very sharp blade. It is an excellent value for the price. It took me a while to finally buy one, when I got it i wished i had eirlier. Very solid knife, blade ejects fast and locks very securly with no blade wobble. it may take a bit of practice to learn how to quickly drawl it from your pocket, release the safty and eject the blade. I have large hands so it doesnt bother me. Razor sharp out of the box and the glass breaker works great. If your a collector you need one of these. Great knife. I purchased the black dagger with serrated edge. 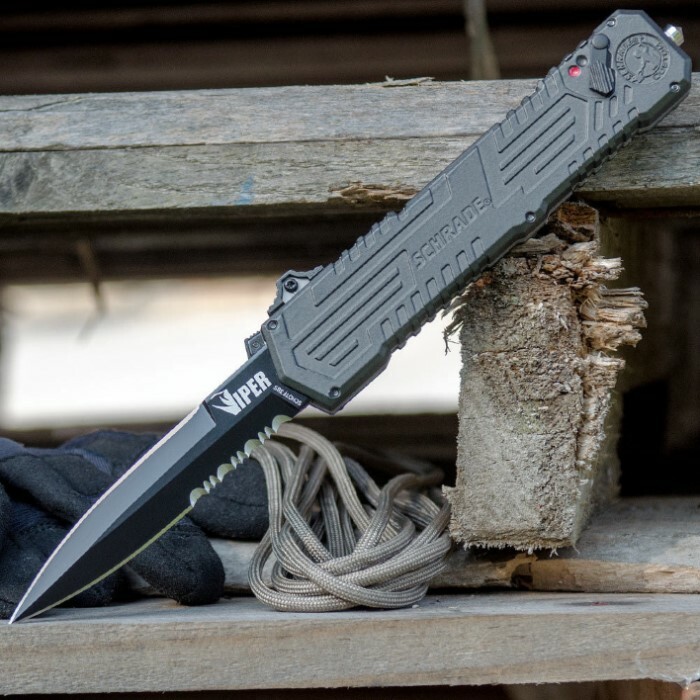 Perfect for self defense because it looks like a simple utility knife, so that adds a little 'surprise factor' when you deploy it.The blade release functions flawlessly. I am very pleased with the purchase. Knife was everything as expected and more. Very sharp out of the box as well. Easy to manipulate and the safety works just like the safety on a handgun.